With four doors and a stylish body design, the Ioniq is already an appealing and convenient design. Add the impressive 58 mpg fuel consumption rate and variety of safety features to the mix, and drivers have a vehicle that provides a total driving experience. While some hybrids require drivers to modify their driving habits, the Ioniq provides its superior fuel efficiency with no change to driver routine. The Ioniq's lithium-ion battery has a lifetime warranty, something that the Ioniq's hybrid competitors do not offer to their drivers. 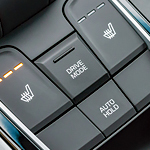 Another advantage is the Ioniq's 139 horsepower and dual driving modes to modify driving style between Sport or Eco settings when acceleration or fuel efficiency is required most.